Martin Marx berichtet an seine Familie in Frankfurt über seine berufliche Tätigkeit zum Jahresende 1939-1940; er deutet an, dass er mit Blick auf Stanley, „ins heiratsfähige Alter“ zu kommen scheint. Das wird bald von großer Bedeutung sein. Der Vater von Job Nachmann starb in Milwaukee. Today I received your letter of Nov 21, in which you stated that you had received my letter of Nov 5th from Chicago. It seems to me that you, dear father sighed relieved as you had heard that I had returned to Chicago. I had not, as of yet invested money into Daly’s business, for I wanted to check it out first. Of course the trip cost me some money and time, but one has to take some risks. And that is actually easier as long as you are not yet here, and I am not married. For, as I observed with Stanley, I seem slowly sliding into a marrying age. Now I am working in a camera shop again, albeit not so elegant as the one before, and every second day until 9 pm, but the pay is better (25 dollars). The shop is a former radio shop that added cameras last year, and currently it sells more of these than of radios. The owner is a good salesman, but does not know much of the technical part. Apart from him and myself, there are two other young men in the radio repair shop, and sometimes his wife also joins us. Contrary to the previous place where we had set listed prices, here we sell everything a bit cheaper and so we have more customers. That’s all the news from Chicago, good and bad, and quite small, compared to what goes on in Europe. Let’s hope it all ends well in the new year. 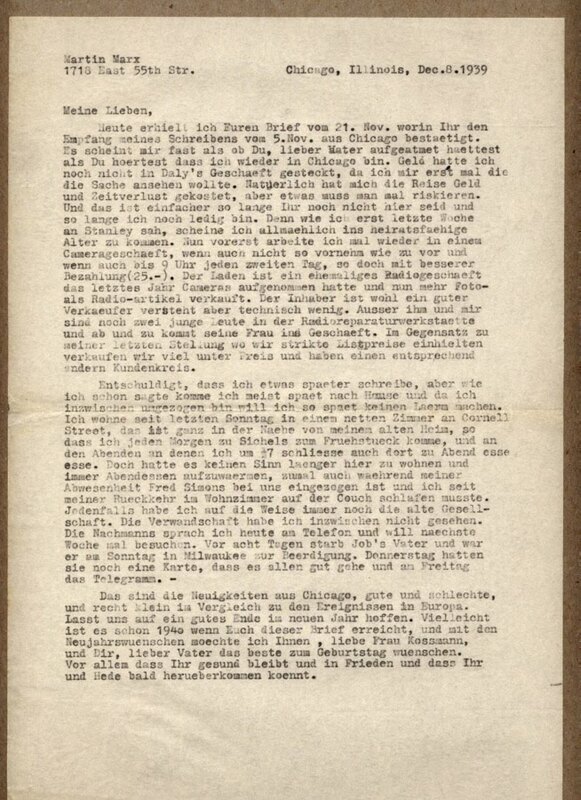 Perhaps it will be 1940 by the time you get this letter, so I would like to wish Happy New Year to you, dear Frau Kossmann, and all the best to you father, to your birthday. Stay healthy, and in peace, and let’s hope you and Hede can soon come over here.